Pennsylvania State University (PSU) has launched an online hub for its researchers to collaborate with industry professionals, obtain funding and increase commercialization opportunities. 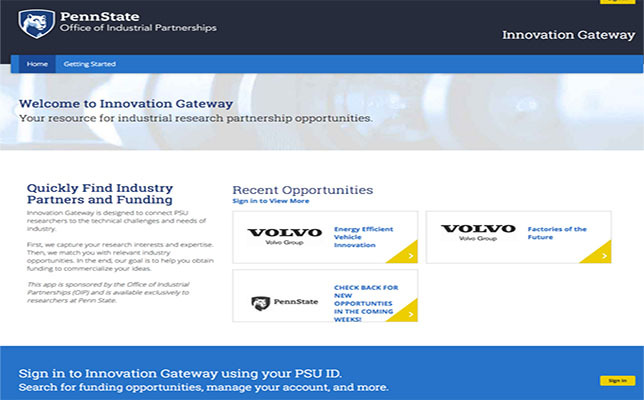 Created by PSU’s Office of Industrial Partnerships (OIP), the Innovation Gateway is designed to connect PSU researchers to the technical challenges of industry. Request to Partner, used when a company is looking for a university researcher to partner on a project. “There are many ways for faculty to stay connected to federal research organizations, but no equivalent for industry research partnerships,” said Jeff Fortin, associate vice president for research and OIP director, in a statement. “With Innovation Gateway, the OIP provides faculty with an unprecedented level of service in building those partnerships. The platform is exclusive to PSU researchers. Several companies have already taken advantage of the Innovation Gateway and posted opportunities. The Volvo Group, Westinghouse, WR Systems, United Technologies and Sherwin Williams are among the first to post on the platform, and Fortin said more companies will join in the coming weeks. To learn more, visit the Innovation Gateway site.